In November 2011, Bangor Land Trust received title to 105 acres next to the Bangor City Forest and Walden-Parke Preserve and across the Bangor Hydro transmission corridor from Northeast Penjajawoc Preserve. This property came from a local developer whose planned housing development intruded into the protection zone of a vernal pool elsewhere in Bangor. His development permit required that he conserve an unprotected vernal pool. He chose to do so by purchasing this parcel and transferring it to Bangor Land Trust, with restrictions imposed by the Army Corps of Engineers and monitored by Brewer Land Trust. The property contains many vernal pools and other wetlands, a stream, a mature mixed forest, and an extensive network of trails. For easier trail identification, kiosks are being added. Pets on leash only are permitted. 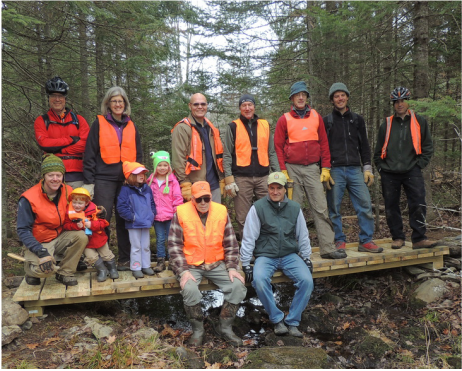 A cheery crowd of 14 able-bodied and energetic outdoor enthusiasts assembled this new - and safe - bridge in North Penjajawoc Forest. Thanks to these volunteers and to Woodard and Curran Foundation for providing funds for the materials.